Back To The Beach will feature a carnival midway, beach games, great food (with vegan options), craft beer and cocktails, and more. Families are invited to explore the Lil’ Punk Kid Zone, which will be a fun all-inclusive safe place for kids 10 & under who are accompanied by an adult. The area will feature healthy food options including a fruit cart, and will give kids a place to play and engage while still being part of the festival experience. Under a tented shade zone, new moms will have a clean, private place to breastfeed, as well as hand washing areas and clean bathrooms for families only. The area will offer face painting and beach games, as well as arts and crafts and much more. While kids enjoy the time of their lives, parents can sit and relax while still listening to and seeing the festival on jumbo screens. 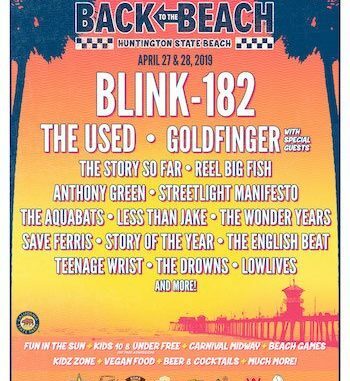 Back To The Beach is produced by Synergy Global Entertainment (SGE), blink-182‘s Travis Barker and Goldfinger‘s John Feldmann. We hope you all had an amazing time at #backtothebeachfest! It was a weekend filled with unforgettable memories, thank you to everyone who came out and shared these moments with us. See you next time!